People celebrate this day and are forbidden to work as a protection against the plague. Young brides get up at dawn and bake breads called `choumini` (meaning `of plague`). They spread honey on them ?to please the old lady, the Plague?, and give them away around the neighbourhood for the health of people and animals. One loaf of bread is always left on the attic to chase away the illnesses. According to the Christian calendar, St. Anton`s Day should be celebrated to protect people from illnesses. On this day women do not spin, knit and cook beans, corn and lentil, because they might make the diseases angry. According to the legends the twin brothers Anton and Atanas were blacksmiths and were the first to invent the blacksmith`s tongs. Anton`s Day is celebrated as a holiday of the blacksmiths, ironmongers, cutters and shoeing smiths. January 17th is the feast of St. Anton/St. Anthony the Great (born ar. 260 AD). 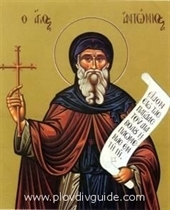 According to his biographer, Atanasius of Alexandria, St. Anthony spent 20 years in complete isolation in a secluded ruined building amidst the desert. He was visited by sick and suffering people and he talked for hours to them. He fought against the Aryan movement denying the holy origin of Jesus, and in an open dispute he managed to win over the proponents of Aryanism. After his death, his relics were moved to Vienna to be kept there.